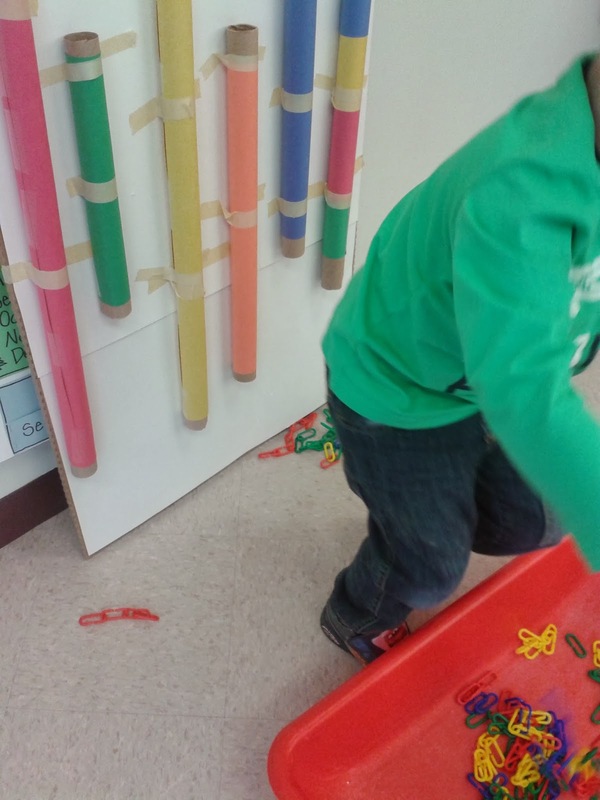 Teach Easy Resources: Stuck for Some new Center Time Activities? Try these! 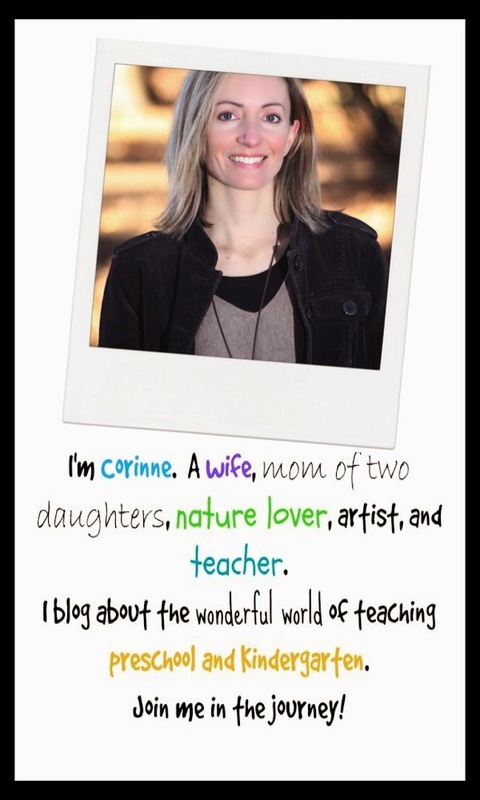 Stuck for Some new Center Time Activities? Try these! I'm on a roll with creating new center time games since returning from Christmas break. With the start of a new year, it seems only fitting to have some fresh, new activities to keep the kids stimulated! Here's what I created this week. 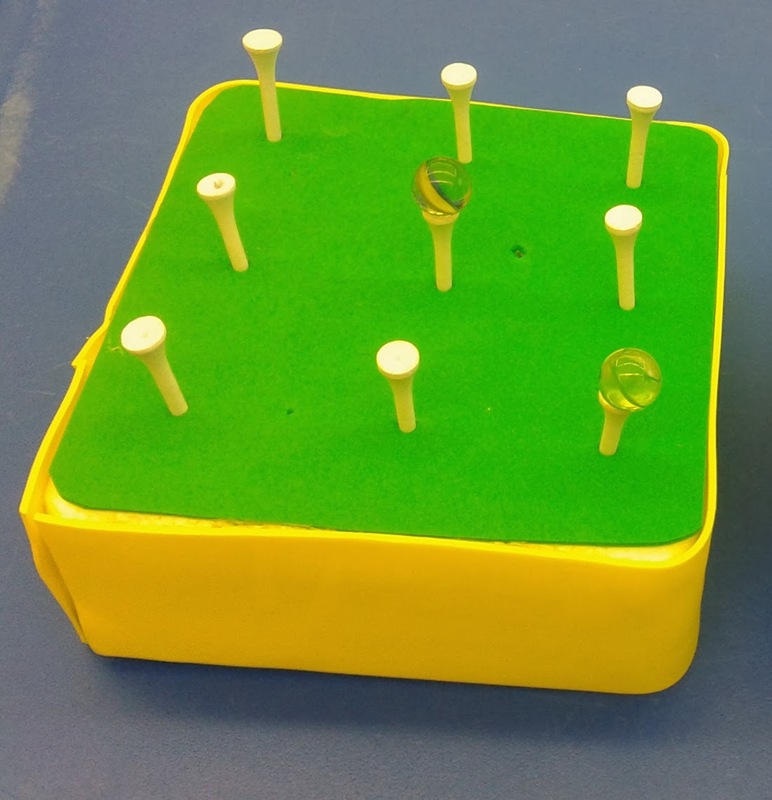 For this game, students use a set of plastic tweezers to pick up the marbles and place them on the golf tees. 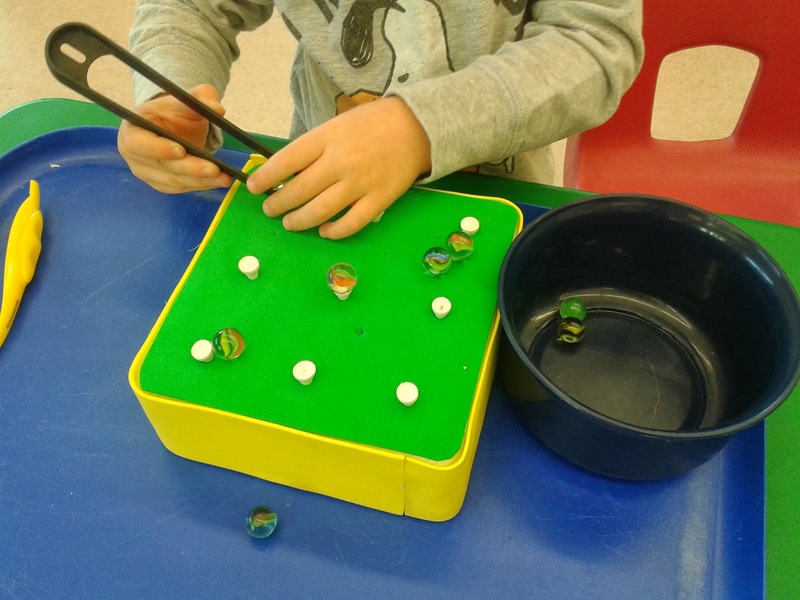 With this activity the children are practicing their fine motor skills and more specifically, the pincer grip necessary for holding and manipulating a pencil. 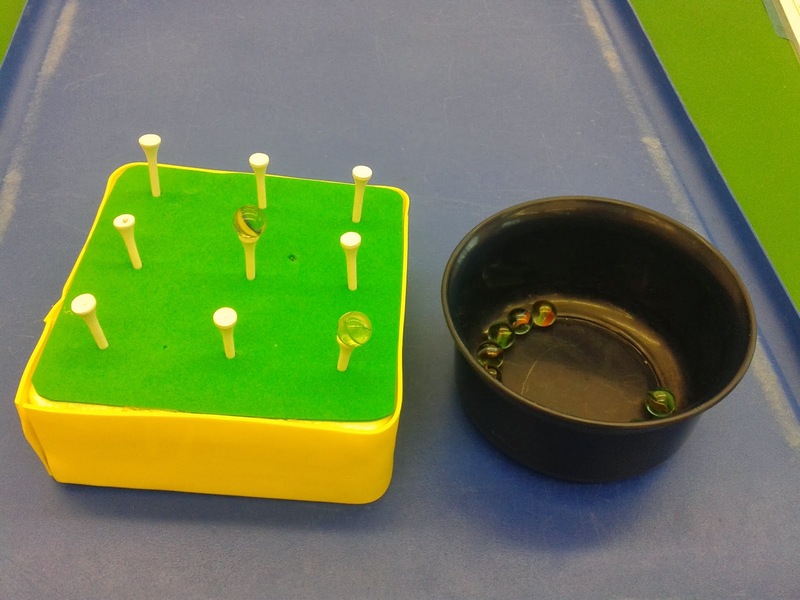 I recommend placing this game on a tray to catch any stray marbles. Here's a closer look at the base of the game. I found a square piece of styrofoam and then used a glue gun to cover it with pieces of yellow and green foam. Not only does the covering make the game look nicer, it will help increase the lifespan of the styrofoam. We once brought a piece of styrofoam that was unprotected into the classroom and it "died" a quick death. After 10 minutes, all that remained was a mysterious pile of white crumbs. Lesson learned! If you'd like to adapt this activity for younger students, craft pom poms can be used instead of the marbles. They're much easier to pick up with the tweezers. 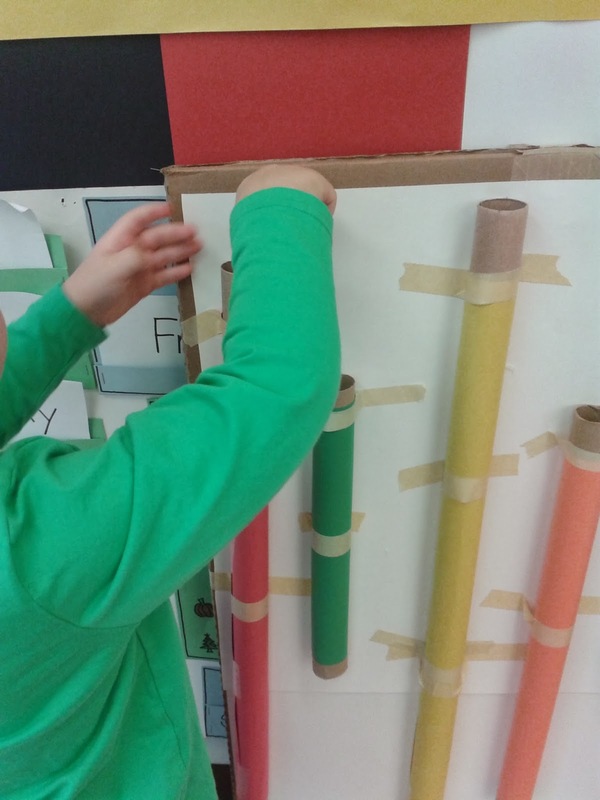 For this activity, the children pick up coloured objects and drop them into the tube of the same colour. Again, the objects can be picked up using tweezers. We didn't have an abundance of pom poms to recreate the original version of this game, so we used our collection of coloured chains instead. 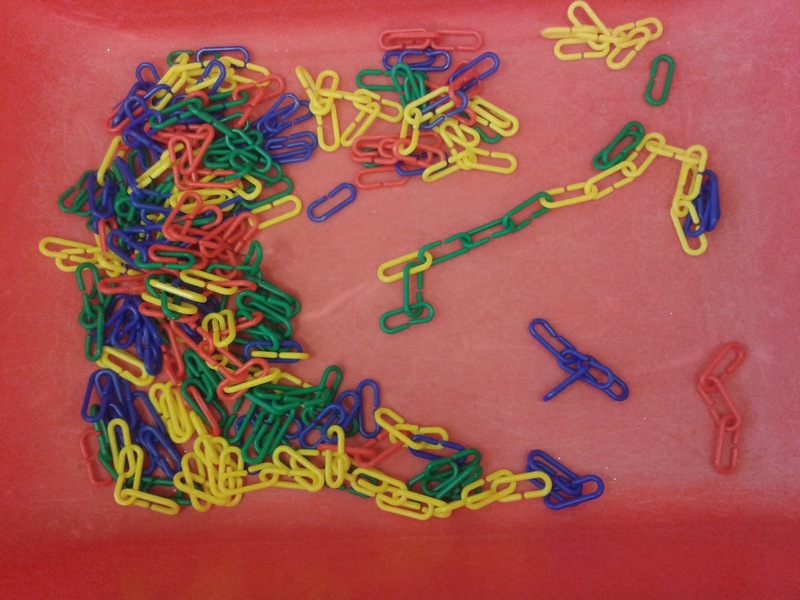 Some of the chains were linked into groupings that were all one colour. Those that were linked with a mix of colours could be dropped in the rainbow coloured tube. The children seemed to have particular fun trying to get the long chains through the tubes. It was definitely more of a challenge!